Valentine's Day Packs On Sale Now! Hit a home run with that special someone this Valentine's Day! 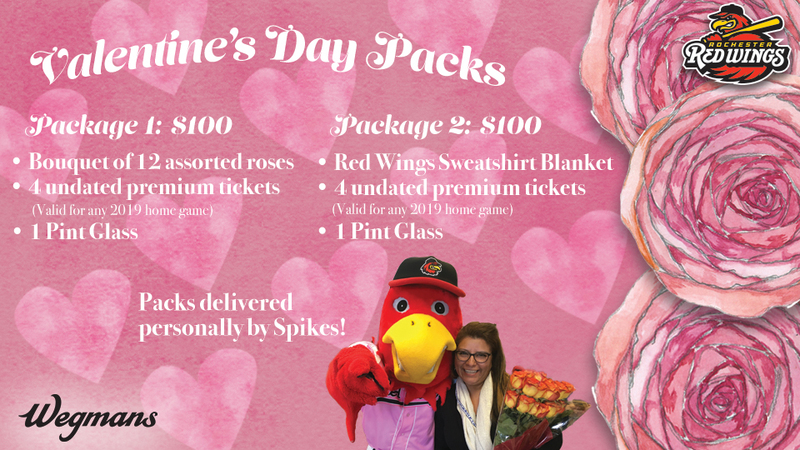 The Red Wings will once again be offering a Valentine's Day Package courtesy of Wegmans with special delivery by Spikes or Wings GM Dan Mason on February 14. The ONLY way to order your Valentine's Day Pack is via phone order. Call Kevin at (585) 454-1001 ext. 3046 to place your order. Fans will have the option to have thier package delivered by Red Wings mascot Spikes or Wings GM Dan Mason. Deliveries will be made between 9 am-5 pm on February 14 and are limited to Monroe County. Due to the volume of deliveries, we're unable to accommodate specific times. In lieu of delivery, fans may also order the package for pickup for $85. Pick ups will take place at the Red Wings Team Store on February 14 between 9 am and 5 pm.